Notes for fiscal policy, and the crowding out effect with graphs - FreeEconHelp.com, Learning Economics... Solved! What is Fiscal Policy: The discretionary actions made by governments to change expenditures or taxes. Generally these actions occur to either mitigate unemployment (expansionary), or curve inflation (contractionary). 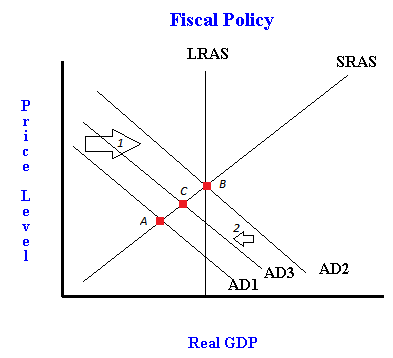 When there is a recessionary gap (Real GDP is less than LRAS GDP) our aggregate demand curve is left of where it should be at long run equilibrium. Instead of waiting for deflation to occur and the labor market to re-achieve equilibrium, the government can enact expansionary spending policy by increasing discretionary spending. This acts to increase the aggregate demand curve to get us back to long run equilibrium immediately. is to the right of where it should be at long run equilibrium. Instead of waiting for inflation to occur, and the labor market to go back to full employment, the government can use contractionary spending policy by decreasing discretionary spending. This causes a decrease in aggregate demand, and helps us get back to the long run equilibrium immediately. Changes in taxes can also be a form of fiscal policy. When we are in a recessionary gap, taxes can be decreased to shift aggregate demand to the right. When we are in an inflationary gap, taxes can be increased to shift aggregate demand to the left. The shifts labeled A and B show expansionary fiscal policy in action. Under these two scenarios, the aggregate demand curve shifts to the right following either a decrease in taxes, or an increase in government spending. The A shift shows a movement from point 3 (a recessionary gap) to point 1, long run equilibrium. The B shift shows a movement from point 1 (long run equilibrium), to point 2 (an inflationary gap). The C and D shifts show contractionary fiscal policy in action. Under these two scenarios, the aggregate demand curve shifts to the left following either an increase in taxes or a decrease in government spending. The C shift shows a movement from point 2 (inflationary gap) to point 1 (long run equilibrium). 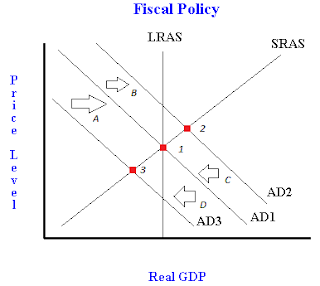 The D shift shows a movement from point 1 (long run equilibrium) to point 3 (a recessionary gap). Any fiscal policy that moves us away from long run equilibrium isn’t desirable because it cannot be maintained. Crowding out because of fiscal policy: when the government increases its discretionary spending or lowers taxes, these policies must be funded by government borrowing. When governments borrow, increases in savings must occur to satisfy the borrowing going on by the government. In order to get this increase in savings, the interest rate has to go up. When interest rates rise, consumers spend less on durable goods (cars, or other financeable items) and houses. Firms also invest less because the opportunity cost of money has risen. Government spending becomes larger than tax revenues. Government needs to borrow money to finance the deficit which requires an increase in economy wide saving. In order to save more, the economy wide interest rate must rise. Higher interest rates increase the opportunity cost of spending/borrowing money so consumption and investment decline. The crowding out effect could cause the aggregate demand curve to shift left after the initial rightward shift because of fiscal policy. Different economists would argue for different amounts of shift back depending on the circumstances. This graph shows the crowding out effect in action. At first we are in a recessionary gap at point A. The government decides to cut taxes (or increase government spending). This results in the first shift, and we move from point A to point B. However, this action also increases interest rates and crowds out private consumption or investment. Because consumption or investment decline, we see a leftward shift (the second shift) in the aggregate demand line, and move from point B to point C.